﻿ Open Staircase Packages | Scotia Stairs Ltd.
Now Available In Many Hardwood Species and Custom Designs By Scotia Stairs Limited. 1-1/2″ to 4″ Thick or Bigger. A single flight open staircase cost break down for a 13 tread open package is: 14 risers x $175.00 per riser = $2,450.00 + tax ( based on the package specs indicated below ). 2 each – 3″ Thick Stringers – Good Two Face Treads With All Edges Slightly Eased ( each stringer will have its inside side face routered out ( dado ) for treads to recess directly into stringers or we can manufacture 2 each stringers that have all the Runs and Risers cut out for you or we can make a double thick mono-stringer, so you only have one single extra thick stringer that runs up the middle point of the treads ). All thick treads are pre-fitted in our custom mill shop before we ship out to you. This insures that there will be no fitting issues on your job site. Spray Booth Finishing is available at a cost of $60.00 per rise + taxes for clear coat. Custom stain finish in a MinWax color (from MinWax 25 oil based stains) or custom stain finish to match your flooring sample is approx. 30% more in cost. Shipping is also available and the cost is quoted as per the job based on total weight and the distance to the customers delivery site. Note: we do not ship glass panels out side our local Greater Halifax service area. The length x width x thickness of the extra thick stair treads and strings you want? 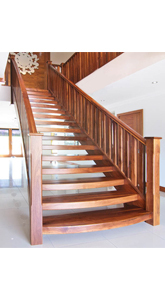 The hardwood specie you want for your open staircase package? 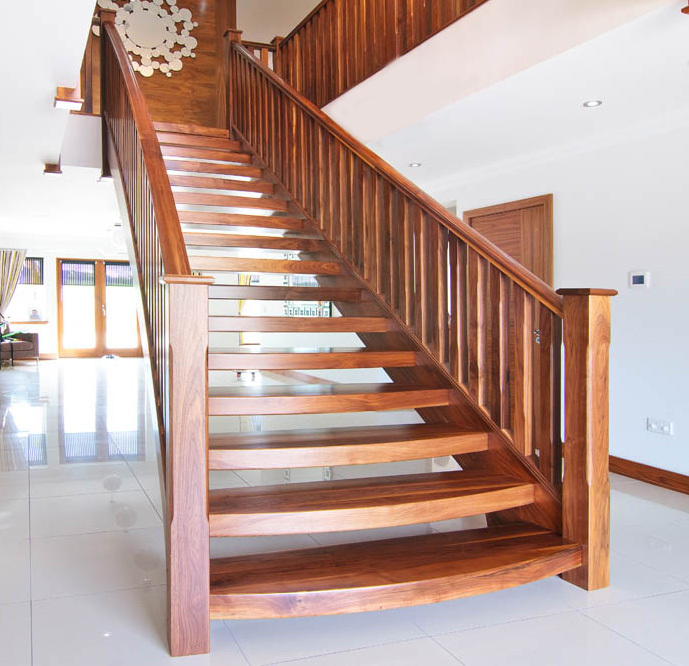 The amount of the extra thick stair treads that you require (or riser amount as it may be more than one flight you need)? All thick treads that are 1-1/2 inches thick and above will be made in the butcher block style millwork construction. We will gladly quote your job with a landed price and a stated lead-time (no hidden fees and no missing details). Please contact us by email today with the full details of your custom open concept staircase design needs.